An Eli Lilly drug for treating soft tissue sarcoma has received accelerated FDA approval, the first new drug to win the regulator’s approval for this type of cancer in more than 40 years. Indianapolis-based Eli Lilly’s (NYSE: LLY) olaratumab (Lartruvo) is an injectable product approved for used in combination with doxorubicin, a chemotherapy drug used to treat a wide range of cancers, including soft tissue sarcoma. As its name suggests, soft tissue sarcoma starts in the soft tissues of the body, such as muscle, tendons, lymph vessels, and nerves. The American Cancer Institute estimated that 12,000 cases of this cancer were diagnosed in the United States in 2015, causing nearly 5,000 deaths. Olaratumab is what’s called a monoclonal antibody. The drug works by binding to a protein called PDGFR alpha, preventing it from connecting to a receptor thought to have a role in driving tumor cell growth. Lilly says its drug is the first monoclonal antibody approved by the FDA to treat soft tissue sarcoma. The FDA granted accelerated approval of olaratumab based on Phase 2 clinical trial results. Accelerated approval is a pathway that streamlines the regulatory review of a drug developed to address an unmet medical need. The Lilly trial evaluated 133 patients who had a type of soft tissue sarcoma that could not be treated with surgery or radiotherapy. In the patient group receiving both Lilly’s cancer drug and doxorubicin, median overall survival improved by 11.8 months compared against the patient group receiving only doxorubicin, Lilly reported. Lilly still must conduct a Phase 3 trial to confirm the results of its earlier study. The company says that the Phase 3 trial is already fully enrolled. 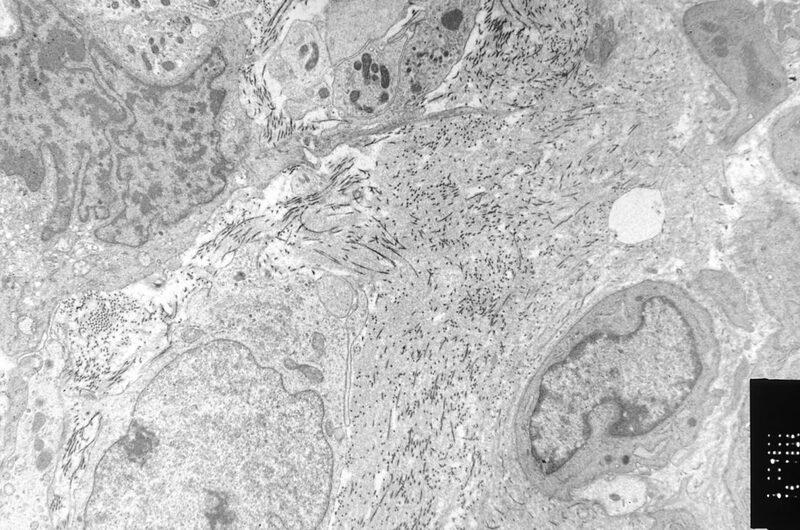 Soft tissue sarcoma image courtesy of the National Cancer Institute.